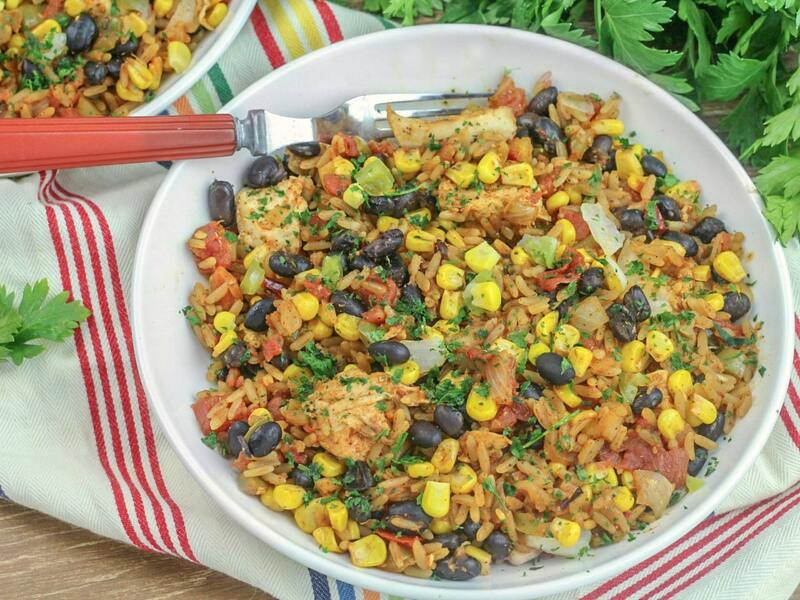 Spicy Mexican Chicken and Rice is an easy one pot meal that is packed with flavor and ready in just thirty minutes! It’s perfect for a busy weeknight or lunch on the weekend! Thank you VEETEE RICE for sponsoring this post and making it so easy to get dinner on the table! All opinions are 100% my own. I love to keep things simple for dinner during the week. There’s nothing easier than a delicious one one pot dinner. 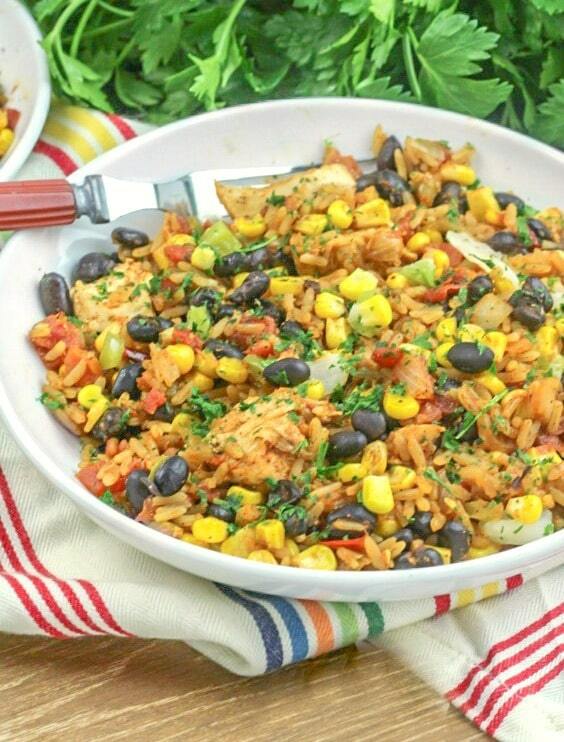 If that dinner happens to be packed with lots Mexican flavors like this Spicy Mexican Chicken and Rice it’s sure to be a hit at my house. For this recipe I used VeeTee’s Spicy Spanish Style Rice. The Spicy Spanish Style Rice. This rice tons of great flavors like onion, red pepper, garlic, and paprika. 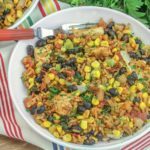 It is also version is also a great side dish on it’s own and since it microwaves in just two minutes it is the perfect choice for your next taco night. With so many different choices, I’m sure no matter what you’re cooking Veetee has a rice that’s perfect to accompany it. Oh, and don’t forget no matter what variety you choose it only takes two minutes to prepare. For more information about Veetee Rice or to find a store near you check out the VeeTee Rice website. 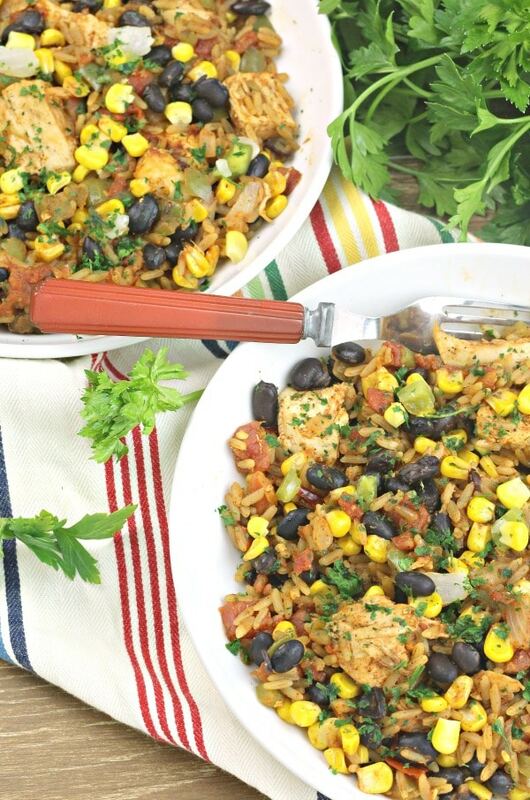 Spicy Mexican Chicken and Rice is an easy one pot meal that is packed with flavor and ready in just thirty minutes! It's perfect for a busy weeknight or lunch on the weekend! Cut chicken into bite sized pieces season with salt and pepper then sauté over medium high heat in olive oil until it is no longer pink. Next, add the onions and bell peppers to the skillet and cook until tender. Then, add the rice, taco seasoning, diced tomatoes and chilies, black beans, corn and enchilada sauce. Stir to combine and then cover and cook for 15 minutes. Finally, add in cheese and stir into mixture until melted. Serve immediately. What a great way to get dinner on the table quickly! This sounds delicious. I’m making it for dinner tonight! 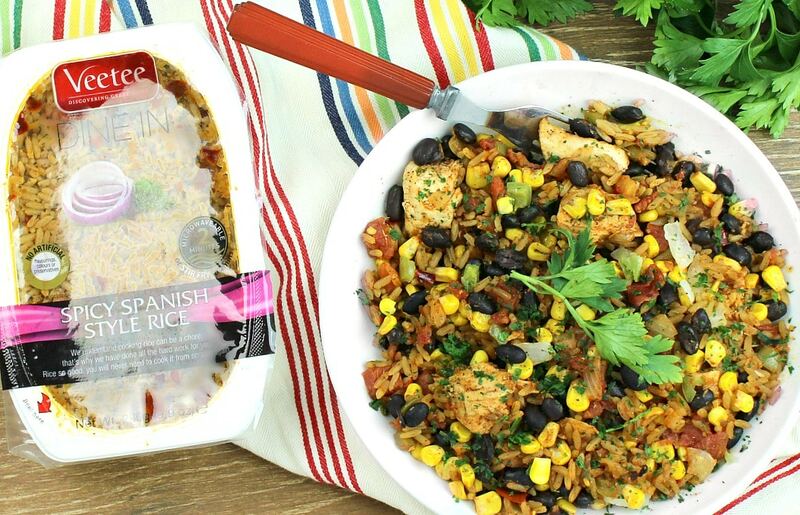 We will love your Spicy Mexican Chicken and Rices, it looks like a delicious dish! Hope you are having a great day and thanks so much for sharing your awesome post with us at Full Plate Thursday.